On Friday, the American Council of Engineering Companies of Houston (“ACEC”) endorsed Sylvester Turner for a second term. The endorsement letter read, in part, “Mayor Turner has demonstrated his commitment to investing in and improving the infrastructure of our City.” Nothing could be further from the truth. 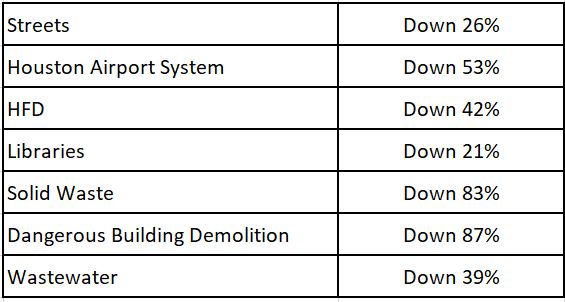 In fact, Turner has the worst infrastructure record of any mayor in recent history. In all, we estimate that infrastructure vendors have contributed over $2.5 million to Turner’s campaign. By the way, don’t for one minute think those contributions are not being passed on to you, the taxpayer, in the form of higher fees. I found their glowing endorsement to be particularly ironic since 8 of the 11 members of ACEC’s Board, including Tim Buscha who penned the letter, don’t live in the City. When they chose where their families would live, they chose Katy, Pearland, Cypress and Tomball over Houston. If the ACEC members want to tell those of us who to vote for, I suggest they first move into the City and put up with dodging the potholes, unreliable garbage pickup, chronic flooding and a police force that hardly ever patrols our neighborhoods – like those of us who actually live in the City. Also, then you could start paying some City property taxes instead of just driving in to pick up million dollar checks at City Hall. ACEC also failed to mention that Turner has actually cut infrastructure spending. 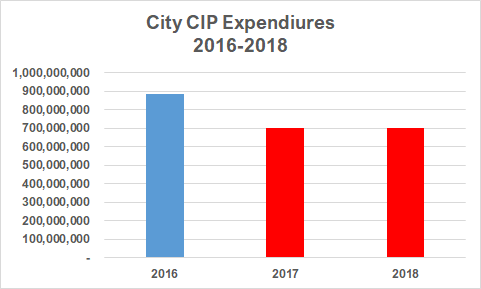 The Parker administration spent $885 million on capital improvement projects (CIP) in its last year. In Turner’s first two years, he averaged spending just over $700 million, a 21% decrease. 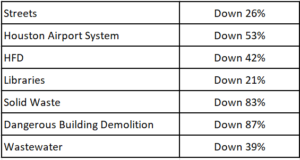 The following table compares Turner’s average spending to the last year of the Parker administration in some key areas. If you are one of the thousands of Houstonians who have blown out a tire or bent a rim or daily dodge the thousands of potholes on Houston’s streets, you are probably wondering what in the world would be the basis for ACEC’s “belief.” Certainly, Turner’s record in his first three years provides no basis to believe our streets will get any better because Turner has dramatically reduced spending on streets. He has repaired only about half the number of potholes Parker did in the last year of her administration. And he has done nothing permanent to correct the dramatic underinvestment in lane reconstruction. 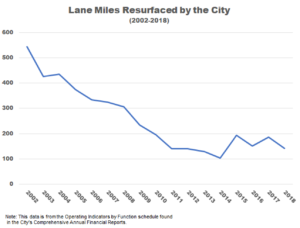 With approximately 16,000 lane miles total, the City needs to be reconstructing about 400 lane miles each year just to keep up. 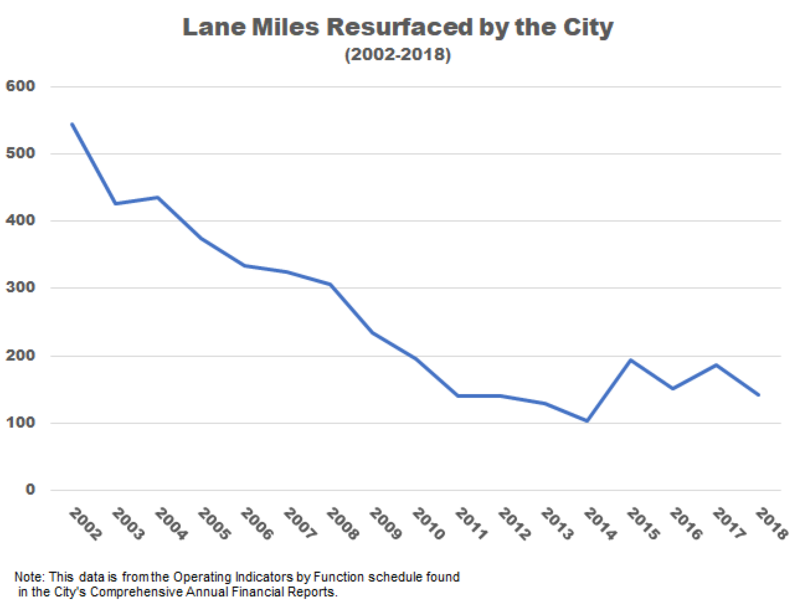 Last year, the City reconstructed 142 lane miles, one of the worst years on record. And, of course, we know that the Turner administration has continued the practice of only spending about half of the drainage fees on actual drainage projects. So, why would a group of highly intelligent professionals attempt to mislead the public about this mayor’s record on infrastructure and pour hundreds of thousands of dollars into the campaign coffers of a mayor with such an abysmal infrastructure record? The answer is that they have to if they want to stay in business. Don’t misunderstand me. I have been where they are. I cannot count the number of calls I got to let me know that the mayor or some council member was having a birthday party and they would like for me to come and help him or her celebrate – provided, of course, I was bringing a check. You have a payroll to make, rent to pay. It is not like they really have much of a choice. It is tantamount to legalized extortion. But we can put an end to this by supporting the End Pay-to-Play PAC. This PAC was formed by some concerned citizens to support a petition drive to adopt an amendment to the City campaign finance ordinance that will dramatically reduce the amount that people who do business with the City can contribute to campaigns. You can help in two ways. First, if you are a registered City voter, you can [CLICK HERE] TO volunteer to be a petition gatherer. The End Pay-to-Play PAC will be collecting the necessary signatures in June. They will need hundreds of volunteers to collect signatures. The End Pay-to-Play PAC will give you the petition form and instructions on how to collect the signatures. It will also be organizing petition gathering events where you can volunteer. This corrupt system is incapable of reforming itself. It is going to take ordinary Houstonians rising up like Peter Finch did in Network and saying, “I’m mad as hell and I am not going to take this anymore.” Don’t wait. Join today with the thousands of Houstonians who are already supporting the petition drive to end pay-to-play at City Hall by clicking below to either volunteer or contribute to End Pay-to-Play! [i] This is just a sampling and I undoubtedly missed some contributions. For example, this does not include contributions from these firms’ lobbyists, and contributions from family members or subcontractors are difficult to identify. An interesting side note is that the members of ACEC that do not do business with the City have made almost no contributions to Turner. If they share view of the City-subservient ACEC members of Turner’s infrastructure record, it has not motivated them to open their wallets.